Milk Chocolate Rose Bouquet is perfect for mum to be as she may be a Princess, a Diva, a Yummy Mummy, a Girly Girl, the Belle of the Ball, a Glamazon, a Foxy Lady , a Fashionista but she is sure to love chocolate. Our chocolate bouquets are guaranteed to bring a smile to her face, whatever the occasion! A beautiful boxed bouquet of one dozen long stem milk chocolate roses. 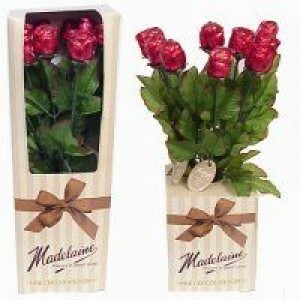 The chocolate roses are displayed as a bouquet and placed inside a matching gift box.